Experimental and theoretical environmental investigation and creation technologies for the protection environment. Geodynamic processes, establishment of geodetic network, selection of coordinate system, creation of the information system with a geodetic base. Investigation of territory planning and sustainable evaluation. Research, development and application for buildings materials, structures and construction technologies. Evaluation of building energy supply and consumption investigation, development and application of their systems and processes. 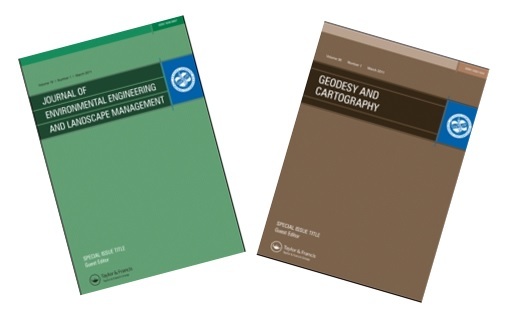 Journal of environmental engineering and landscape management ( abstracted in databases: Science Citation Index ExpandedTM (Web of Science), Index Copernicus, Compendex, CSA Materials Research Database with METADEX (Cambridge Scientific Abstracts), Current Abstracts since 2005 (EBSCO publishing), Environment Complete since 2005 (EBSCO publishing), Environment Index since 2005 ( EBSCO publishing), Garden. Landscape and Horticulture Index since 2005 (EBSCO publishing), TOC Premier since ( EBSCO publishing ), SCOPUS (Elsiever), ICONDA (IRBdirect), VINITI)). Geodesy & Cartography (abstracted in databases: ElsevierDefinitive Bibliographic Database for Engineering Literature (COMPENDEX), Cambridge Scientific Abstracts (CSA), Publishing Bibliographic and Full Text Database (EBSCO), Literature Database Geodesy, Photogrammetry and Cartography (GEOPHOKA), ElsevierAbstract and citation database of research literature and quality web sources (SCOPUS)).